I downloaded a firmware pack through Samsung Mobile Firmware Downloader.. I just want to flash the .nb0 part to my phone..
you can flash .mst just like .nbo, its the same thing. After running app, go to page (tab) "TOOL -> MST", select your mst file and press "GO" button. After that you will get .mli file and message box with question about further conversion to .nb0. No. It's not the same. nb0 contains only PDA part, while .mst is combination of PDA and EBoot so AFAIK .nb0 file flashes directly to devices memory, while .mst writes itself (.mli file) to hidden partition on device and after that flashes itself to device memory. So after .nb0 you still have your previous (factory or .mst flashed) PDA part on your flash hidden partition and for example you are able to restore it by language change procedure (in Samsung Settings). I know that I can flash the .MST with OctansMini.. and later extract the .nb0 from my phone.. but I don't want to do that.. 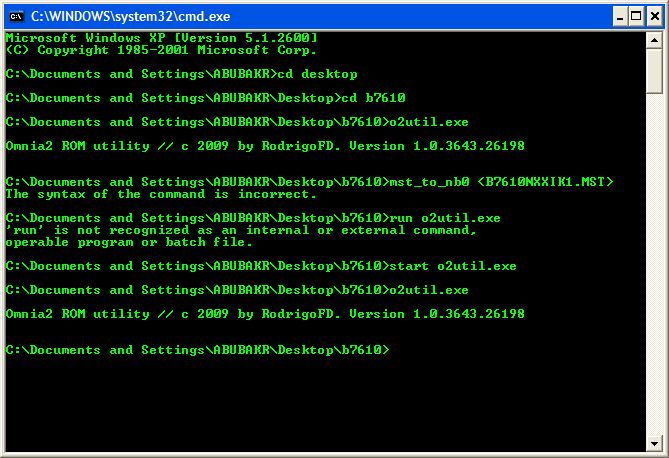 I just want to extract the .nb0 from .MST and flash only .nb0 part..
Maybe you should try older version. I did that more than once and everything was ok (v. 2.61 or something like that). 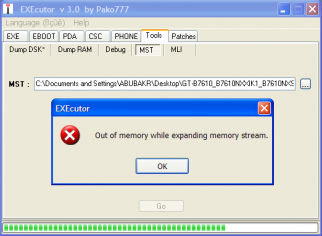 there is only EXEcutor_3.0 available ..
Could u please upload v. 2.61 if u have it ? or please provide me a link to download the old version.. I am using Windows Xp Sp3 (4gb RAM+3gb pagefile).. and its fully updated.. yes, .NET 3.5 installed.. 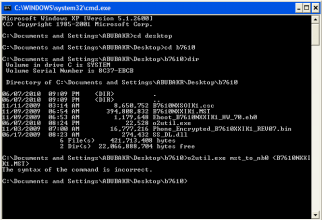 I opened CMD and opened o2util.exe and wrote mst_to_nb0 <mst_file>.. got syntax error.. 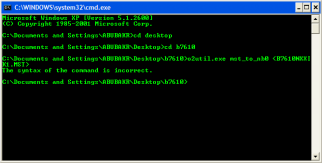 I would appreciate your help..
You need to type "o2util.exe mst_to_nb0 <filename>"
then i got the syntax error..
Are you sure your file is in the same directory as o2util? 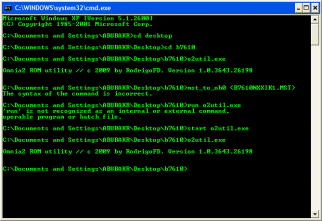 yep.. they are all in the same directory..
please have a look at my screenshot.. 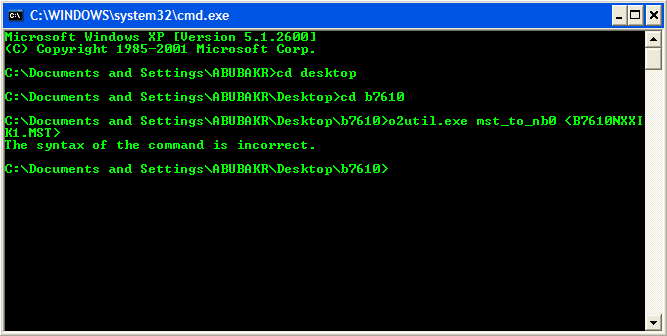 Copy the above line into cmd.exe window and give it few minutes to do it's job. 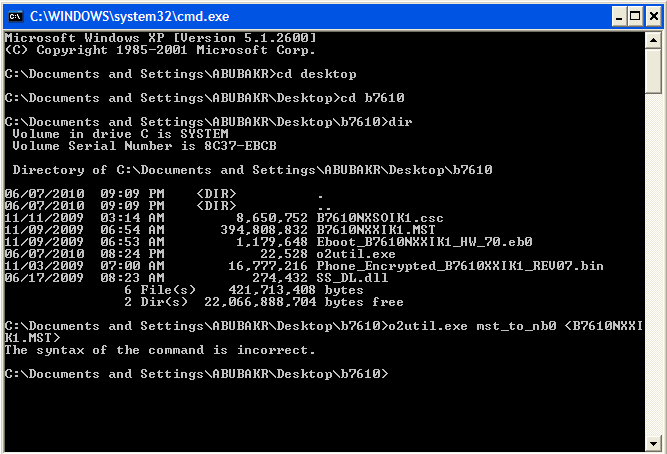 If it doesn't work, you have to move o2util.exe and B7610NXXIK1.MST files into upper directory. Remember, for command line tools shorter path is always better. 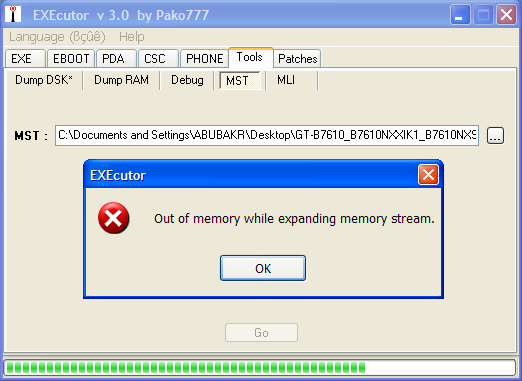 then type the command (without ""
it will extract .nb0 named "extracted.nb0"
well 32bit utilizes 3gb ram,, thats more than enough of me..
and yea..it can run anything i throw at it.. tried Vista and Seven.. 32 & 64 bits.. all of them suckz (sorry if i hurt anyone there..! :) )..
Good old xp is the best.. I can do what ever I wish in it.. its classsy... :) modding n tweaking no problem at all.. Thanks to Chefs and all those who help n00bs like me here..!